The fire broke out around 10:30 a.m. Friday in the 30500 block of Silverado Canyon Road in a remote part of the Cleveland National Forest, about 20 miles east of Santa Ana, officials said. Fire officials believe the Silverado Fire, which has burned an estimated 1,500 acres and caused mandatory evacuations in Orange County, began in someone's backyard. Details about the origin of the fire were limited. "The fire got started off the forest, and because of the terrain and the fuels and because of the prevailing winds, it took the fire into the forest," said Chon Bribiescas of the Incident Command Team for the U.S. Forest Service. "Right now we don’t know what activity caused that." Firefighters doubled the number of personnel fighting the Silverado Fire Saturday morning in anticipation of the triple-digit heat that could further spread the flames. A smoke advisory was issued throughout Orange and Riverside counties, including Irvine to the west, Corona to the north, Lake Elsinore to the east, and San Clemente to the south. By Saturday morning, firefighters said the blaze was about 10 percent contained. The fire acreage estimate fluctuated between 1,500 and 1,600 acres. Mandatory evacuations had been issued at 6 p.m. Friday for residents living from 30500 Silverado Canyon Road east to the end of the canyon, according to the Orange County Sheriff’s Department. Evacuations remained in effect through Saturday night. Fire officials counted 217 homes in the canyon. Those living in the lower canyon were allowed to return home Friday night. The uppermost 30 homes were subject to mandatory evacuation. "I’m just going to pack up and go and be on the safe side," resident Melissa Maddy Jacobs said. "We’ll feel a little bit safer being on a different part of town." An evacuation center was set up at El Modena High School at 3920 E. Spring St. in Orange. 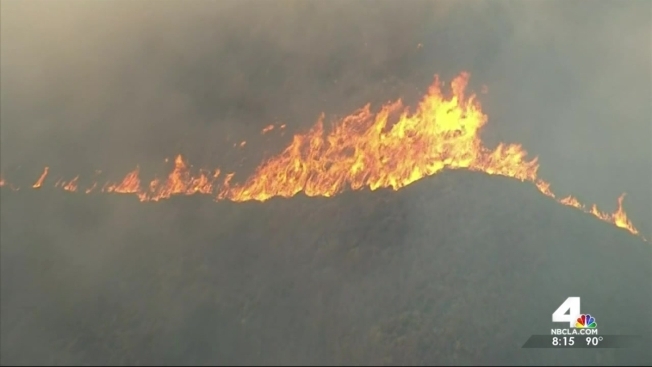 The blaze was initially reported at about 15 acres, burning in Silverado Canyon near the Orange/Riverside County border, but grew to more than 1,000 acres by the afternoon, according to the U.S. Forest Service, which was leading the firefight. The fire had stopped at 1,600 acres Friday night thanks in part to a change in humidity and the arrival of a down canyon wind. For the most part, the fire had been burning uphill during the day. Because of the triple-digit heat expected Saturday, firefighters planned to nearly double the number of people fighting the fire. As of Friday night, 280 personnel were helping fight the blaze. Three firefighters were hospitalized with heat-related injuries overnight, but all were expected to be battling the blaze Saturday. "Tomorrow morning we’re going to be gearing up early, we’ll have aircraft up at first light – that includes fixed wing and rotary wing. The goal is to hit it hard and as quickly as we can in the morning, and hopefully get as much line constructed before it really warms up in the afternoon,” a fire official said. Temperatures started off in the upper 60s in Orange County Saturday morning, but temperatures were expected to heat up later in the day. "By this afternoon we are going to be in the triple-digit territory," NBC4 meteorologist Elita Loresca said. Firefighters were expected to be helped by a lack of Santa Ana winds, Loresca said.